Quick! What's the name of the of the science fiction movie with the tall blue aliens that work as a rather obvious social metaphor? Most people would probably respond with James Cameron's Avatar, but that description works equal well for the 1973 animated film, Fantastic Planet. 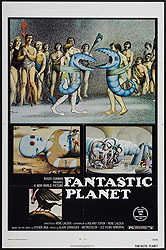 Fantastic Planet (originally titled La Planète sauvage) was a French-Czechoslovakian co-production, adapted from a French novel. It took home the special jury prize from the Cannes Film Festival the year it was released. Since then, it has grown (faded?) into semi-obscure cult classic. The vast majority of the film takes place on the home world of the Draags, the humanoid blue aliens mentioned above. The Draags are enormous and incredibly long lived compared to the humans that live among them as pets or pests. There's never an explanation as to how this state of affairs came to be. That chapter of human history appears to have been lost of generations of illiteracy and subjugation. Things begin to change with a human (or Om, as the Draags call them) named Terr. Terr is kept as a pet by young, female Draag named Tiwa. A kind but careless owner, Tiwa inadvertently allows Terr to build up his knowledge in all sorts of ways when she isn't looking. Most useful are the "earphones", a sort of psychic headset that Tiwa uses for her education. Terr leans a great deal about the world around him by standing inside these earphones. He later brings them to a colony of other Oms living in a Draag park, where they become pabulum for a budding revolution. The film was made using cutout animation, similar in style and appearance to Terry Gilliam's animated interludes in Monty Python. There's not as much movement as you find in computer or even most hand-drawn animation, though this works with the pensive feel of the movie. In addition, there seems to be deliberate care given to the colors used in each panel. The brown and yellow palate of most scenes do as much to create the feeling of being on an alien world as the bizarre plant and animal life we find there. The plot moves slowly and meanders at a few points, usually to make room for a surreal interlude. At one point, Terr walks in on Tiwa's father, a high ranking Draag official, in the middle of a group mediation session. As Terr watches, the bodies of the mediators start to flicker and morph and mix with each other. Technically, the scene drives home the spiritual enlightenment that the Draags pride themselves on, a self-concept importantly at odds with their treatment of the Oms. But the fact that is point is illustrated in such a visually daring way makes it clear that the director is indulging in some strange imagery to advance his vision. Does it work? That probably depends on how much you like weird for the sake of weird, but for my money, these scenes are fun, without overdoing it. It's fairly obvious that the subjugation of the Oms by the Draags is meant to be taken allegorically. It's a classic "How would you like it if…" thought experiment. What the allegory represents is less clear. Are humans reduced to tiny, wild vermin so that the audience can better empathize with how environmental exploitation damages other living things? Or maybe the size and power of the Draags is supposed to make us think about colonialism. Ordinarily, such ambiguity would weaken the message, and subsequently the film. But somehow, that's not the case here. Maybe it's because the rest of the movie is so worthwhile, even without thinking about the message. And so, Fantastic Planet achieves that truly rare thing among works of speculative fiction- a valuable metaphor. Admittedly, there are times when the story starts to feel a bit preachy. But these moments are few and far between, and diluted by the spellbindingly surreal inventions that wash over the rest of the film.